BioCatch is helping to drive the future of the insurance industry by transforming the online application and enrollment process. Our solution leads to higher customer acquisition rates and less fraud. There are many faces of fraud in the insurance market. Cybercriminals use stolen identities to obtain a new policy or, just as troubling, to conduct an account takeover and make false claims or change payee information to receive claim funds. And when fraud hits, it hurts everyone in the pool. As more functions move to the digital channel, addressing this risk – which the FBI estimates to cost $40B a year, not including health care fraud – is key to doing business online and providing good customer service. The BioCatch solution is uniquely suited to address these challenges, providing passive, continuous authentication for mobile and web users. 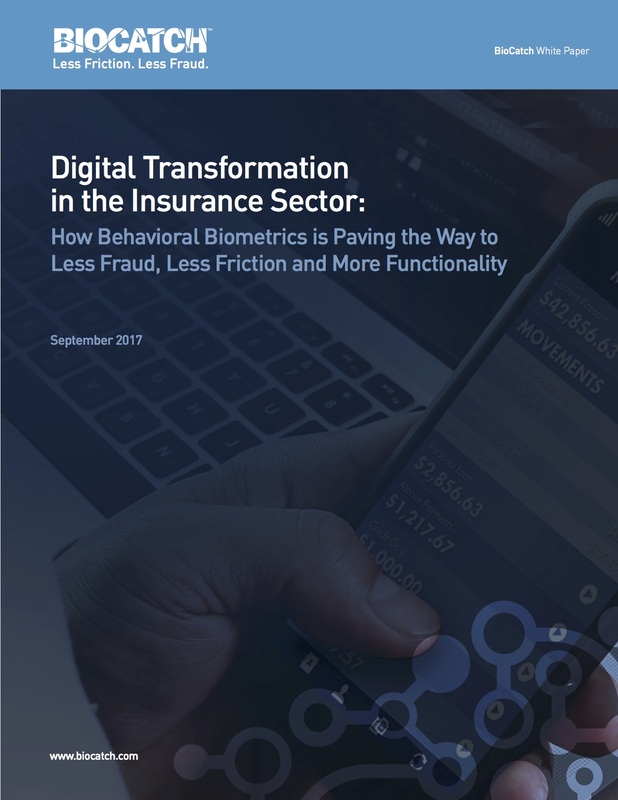 As insurance companies push different functionalities and capabilities to the digital channel, integrating BioCatch on the platform can provide extensive benefits, both from a fraud reduction perspective and a user experience perspective. Proven ROI. Deployments with tier one financial institutions around the world cover 90 million users with 10x-15x return on investment. Commitment to continued innovation. Our broad patent portfolio - including more than 60 patents granted or pending - drives differentiation and technological leadership in dealing with today’s changing digital identity landscape. Support for the entire digital identity life cycle. 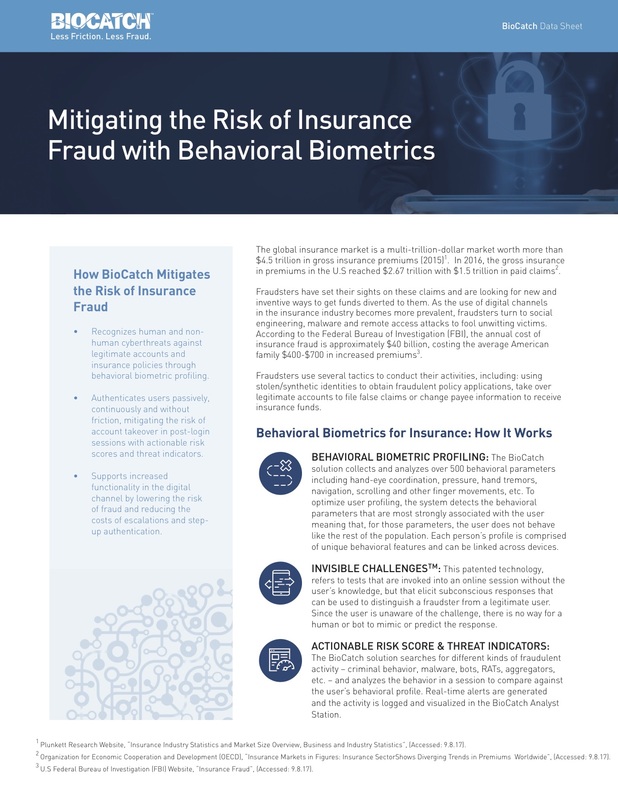 BioCatch’s 2000+ behavioral profiling metrics generate powerful insights that can be applied to identity proofing, continuous authentication, account takeover fraud prevention and more. We provide identity verification for legitimate users and detect a full range of human as well as non-human (RAT, malware, aggregator, robotic activity) cybersecurity threats to keep ahead of the fraudsters and change the rules of the game. Prevent the use of stolen or synthetic identities in the application process through the use of advanced capabilities, like understanding navigational fluency, application fluency and data familiarity, even when no user profile exists. Efficiently and transparently authenticate legitimate users based on a dynamic behavioral profile, injecting Invisible Challenges to ensure session integrity post-login. Detect social engineering, bot activity, targeted malware, spoofing and other fraudulent behaviors before the damage is done by modeling different types of genuine and malicious behavior and enabling real-time action.